Before all-natural nail salons were so trendy, before a complimentary glass of wine was basically a given, and before San Francisco started to dominate the tech scene, former real estate agent Rachel Cheng had a vision to open up a healthier, cleaner salon with more consistent services than she’d been able to find in the Bay Area. But first-time customers soon became loyal clients and friends, drawn by the unwavering quality at Zaza, a name meaning “belonging to all” or “movement” that Cheng read in a baby book. 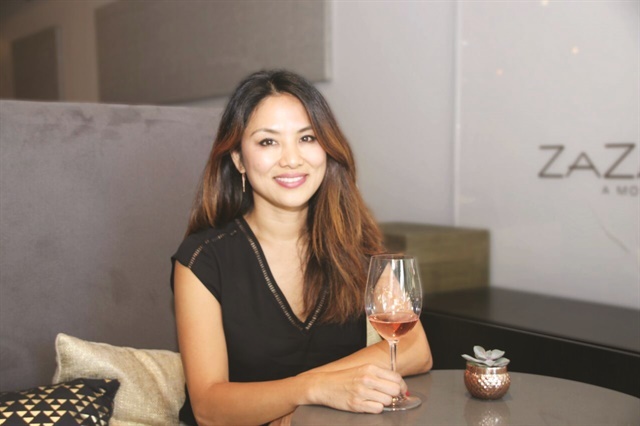 When Cheng combined quality services with sommelier-quality wine, she says Zaza instantly became a staple to the surrounding community. The salon is a couple of blocks away from AT&T Park, the Giants’ football stadium that overlooks the harbor and draws in wives of the team’s players, as well as lots of out-of-towners from surrounding hotels. While visitors often elect to get acrylics, rhinestones, or other types of nail art, Cheng says the majority of Zaza’s regular local clientele err on the conservative side and prefer a simple-yet-classy manicure as opposed to any funky designs. Cheng has witnessed many drastic changes in the culture of the South Beach neighborhood, once a remote area that has evolved into a thriving business district full of high rises, tech startups, and venture capitalists. Zaza also does lots of pop-ups, a popular tactic in San Francisco that helps businesses to showcase their work and gain exposure — not that Zaza necessarily needs it. 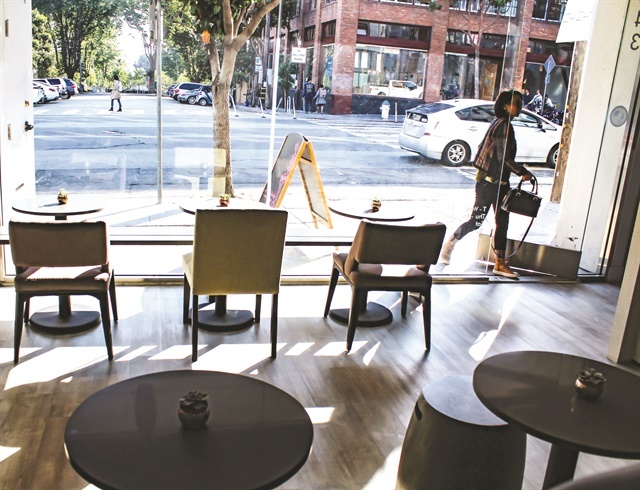 Its established brick-and-mortar is in one of the busiest neighborhoods of the city. The salon’s focus is on performing a well-executed all-natural manicure that’s understated yet appreciated by the corporate clientele. (They also do waxing, lash extensions, and facials, but nails make up most of their business.) 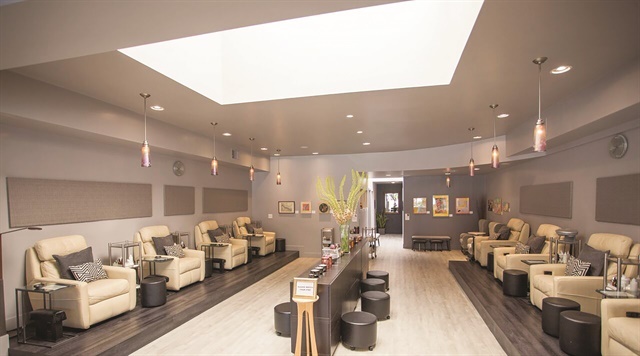 Zaza’s price points are in line with the rest of the city, with a gel manicure and classic pedicure starting at $45 and $35 respectively. Their other huge focus? Wine. 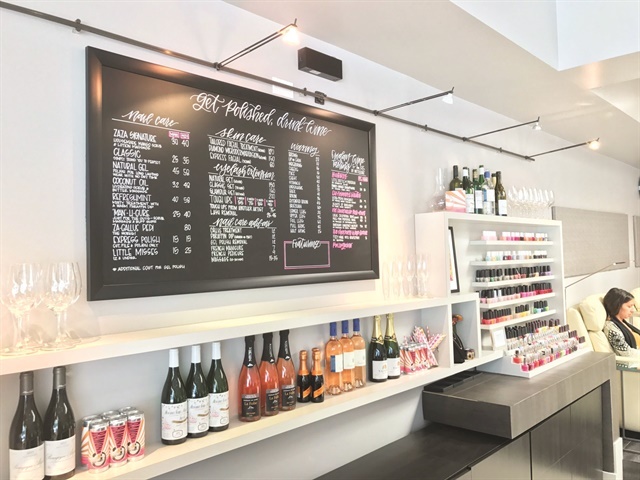 Because the wine is all-natural and hand-selected, Cheng likes to call the professionally curated collection “no-headache wine.” Most of their wine menu is light and refreshing, and she says rosé was a big hit this past summer. Zaza’s decor is on the classy and conservative side with limestone countertops, gray walls, and purple couches in the front waiting area, which was recently transformed into more of a wine lounge. Clients are encouraged to relax and chat with friends as they wait for their polish to dry or for a friend to finish her appointment, but many stay just to socialize. The Zaza team knows how to have fun while on the clock, and having a personality cohesive with the rest of the staff is just as important as technical skill. Their loyalty is apparent, as some staff members have been with Zaza since inception. Cheng says this is because employees are well-taken care of.